Oh.....if only your birds could clean their own bird cages (LOL).....but we know that can't happen. 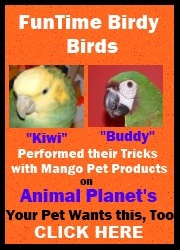 So to make their human companion's life easier here are the tools needed to keep your feathered friends home clean. I have found these bird cage cleaning supplies to be my go to choice when cleaning all my feathered friend's homes.